Two suicide bombings in the southern suburbs of Beirut have left at least 43 people dead, the Interior Ministry said. The death toll is expected to rise with Lebanon's Red Cross putting the number of those injured at over 200. Health Minister Wael Abu Faour said 43 people were killed and 240 people were wounded, according to Reuters. Islamic State militants have claimed responsibility for the attack. IS (formerly ISIS/ISIL) claimed on Twitter that their agents blew up a bike with explosives in the middle of a street in Beirut’s southern suburbs. The first blast occurred outside a Shiite Mosque, while the other took place inside a nearby bakery just before 6 p.m. The suicide bombers were wearing explosives vests, AFP reports. The second bomb reportedly went off seven minutes later as passers-by tried to help those injured in the initial blast. A potential third attacker was killed before he managed to blow himself up. He was found dead with his legs torn off but still wearing an explosives’ belt, a Lebanese security official reported, according to AP. The explosions rocked the commercial area in the southern Borj al-Barajneh suburb of the Lebanese capital, BNO News reported. The busy neighborhood is regarded a stronghold of Shiite movement Hezbollah, who promised to keep on fighting against Islamic State in the wake of the attack. Hospitals in the south of Beirut are encouraging people to donate blood due to an unprecedented number of casualties. People were also asked to leave the area since their presence is hindering ambulances from taking the injured to medical institutions. There is still the possibility of further attacks being carried out. The Lebanese Prime Minister Tammam Salam has declared a day of national mourning on Friday, November 13. 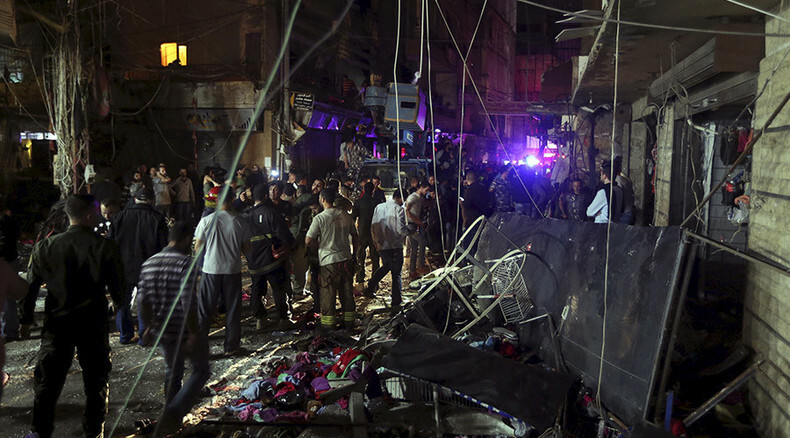 Lebanon has been rocked by several explosions this year, which have killed dozens of people. The latest attack saw a bomb blast in the town of Arsal, near the Syrian border. The bomb was hidden in a motorcycle and killed six people, according to the National News Agency.